What Are The Best Hoof Boots For Horses On The Market? Although the majority of horses are shod, there is a large – and growing – number which are kept barefoot. There are many health benefits to a barefoot horse, which include the feet being able to assume a more natural shape, and able to grow freely. Barefoot horse’s feet are just as strong as the shod ones, in fact they are generally stronger, having been left out in the elements to toughen up – rather like what would happen to people’s feet if everyone decided to ditch shoes for good and wander around barefoot! There can also be health reasons for leaving a horse unshod – for example severe laminitis – so it is more common than people are led to believe. 2.1 1. How long will high quality hoof boots last? 2.2 2. How do you measure your horse’s hooves for boots? 2.3 3. Should horses wear boots on all four hooves? 2.4 4. How can you tell if your horse needs boots on the hind hooves? 2.5 5. Why is it best to have boots on the front hooves? 2.6 6. How long does it take to break in hoof boots? 2.7 7. Can hoof boots be worn for extended periods of time? 2.8 8. Is it safe to leave a horse in hoof boots for an extended period of time? 2.9 9. How can you prevent dirt and bacteria buildup in hoof boots? 2.10 10. Can hoof boots be worn over traditional metal horseshoes? 2.11 11. How can you protect the insides of hoof boots from excessive wear? 2.12 12. How do you clean hoof boots? 2.13 13. Are hoof boots good for endurance riding? 2.14 14. Can you use traction studs with hoof boots? 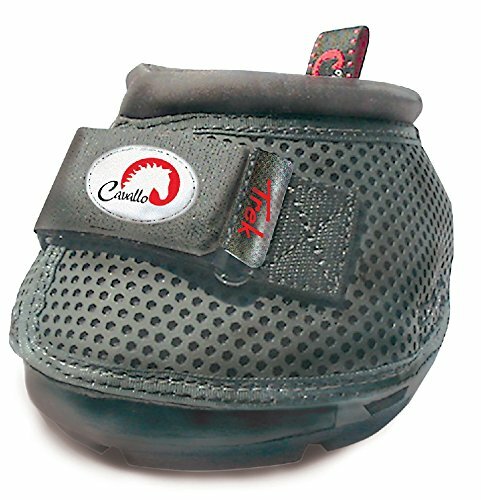 This boot offers total protection and comfort to the barefoot horse. It supports the frog and has a built in skid brake, perfect for an all-terrain boot! It is lightweight, with a breathable upper for ventilation. Can be bought singly – This makes them ideal for temporarily replacing one lost shoe, and for horses with odd-sized hooves or for rehab. Easy to get on and off – The patented Velcro® recloseable system is simple to secure and remove, yet strong enough to withstand some serious galloping. Durable and strong for long life – The honeycomb upper design is very tough. Made of Pro Mesh moulded TPU, it is made to stand up to abrasions and tears. Fits left or right hooves – This is great because it means you don’t have to worry about buying specific boots for specific feet, and if you lose one then you can just put on the spare without worrying that it’s for the wrong foot! The tread may wear quickly – You may be expecting years of use from these boots, but if you ride over very hard terrain then the tread may disappear faster than you want it to. Simply a functional, convenient and good quality solution for those who do not wish, or cannot, get their horses shod. They are lightweight enough that the horse can move freely, yet strong and durable enough for some serious riding. If you are looking to protect your horse’s feet and move away from conventional shoeing, this boot is ideal. This is an all-terrain boot suitable for just about any horse, particularly those recovering from laminitis, navicular, abscesses or injuries. Perfect for taking out and about with you if your horse is shod – no more worrying about limping home with one shoe missing! Highest quality materials – This boot is made from genuine leather, which is hard wearing and strong. It is also comfortable and flexible enough that your horse can move about freely. Strong Velcro fastening stays on even through water – You won’t have to worry about replacing the Velcro (although that is an option with these boots) as it is strong and stable enough to survive even sloshing through waterways. Great value for money – Because they last so long, you shouldn’t have to invest money replacing these boots – unless you accidentally leave one behind at a show! Can allow mud and debris in – The ventilation holes have been known to let in the odd bit of mud and dirt, which is not ideal if you are trying to keep an abscessed foot clean. A high quality boot suitable for just about any horse, these boots can make even the most sensitive-footed equine much more comfortable. It is worth bearing in mind that if you are buying them to cover an injury or abscess, you should order a bigger size to allow room for the packing material over the wound. 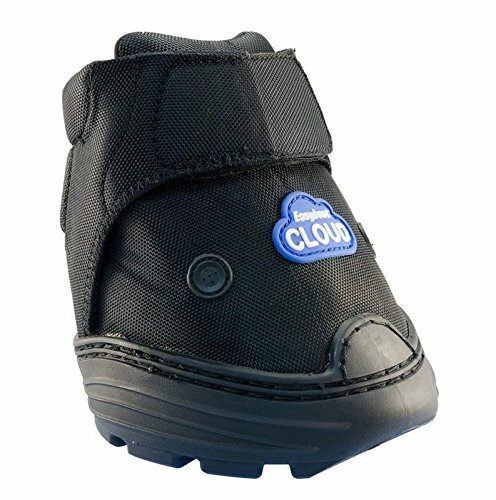 The Easyboot Cloud is designed for the horse that is suffering or recovering from chronic lameness caused by arthritis, laminitis, injuries or just general hoof problems. They are designed to be worn at any time, so your sore-footed friend can even wear them while turned out. 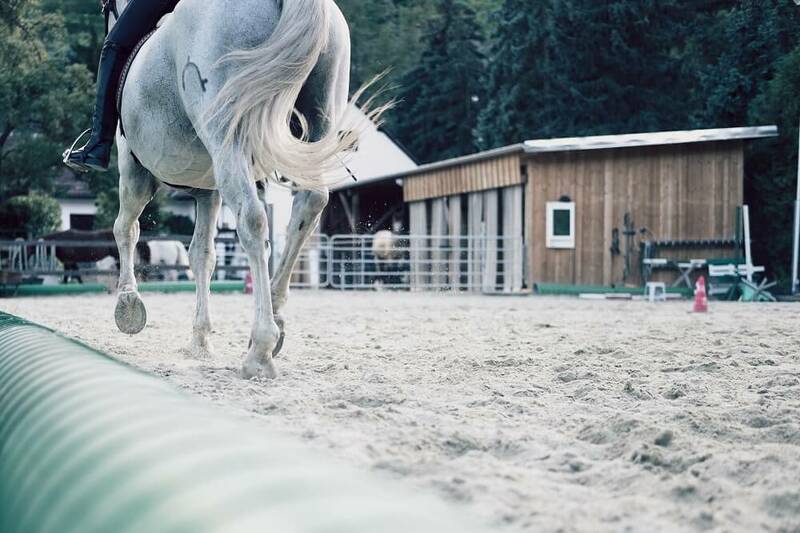 Aids free movement – This sounds like a small thing, but being lightweight and comfortable means your horse can move about, thus drastically improving his chances of a full recovery following injury or illness. Three air vents for air circulation – This is particularly important if your horse is going to be wearing the boots for a long time; keeping good air flow minimises the chances of bacteria and infection. Removable EVA pad for comfort – This provides support to the sole, but is removable, meaning that if it no longer needed or it’s adding too much to the size of the boot you can just take it out. Padded for extra comfort – If your horse is going to be wearing these for a while then you will want to know he’s comfortable. With added padding around the pastern, you will be comfortable in the knowledge he is as comfy as he can be. Can become waterlogged – Due to a lack of drainage hole, if your paddock becomes a pool then these boots can fill up with water. Great for the horse who has chronic or acute lameness problems or foot issues, these boots are a great temporary fix. They will support the entire hoof, and ensure that no muck or bacteria get to the affected area. 1. How long will high quality hoof boots last? On average, top quality hoof boots can last a year or two; however, many trail riders report using good boots for even longer than that. 2. How do you measure your horse’s hooves for boots? Measure each hoof individually, from front-to-back and from side-to-side. Measure from the toe to the buttress line of the hoof. Don’t measure the heel bulbs. Measure the width of each hoof across the widest aspect of the hoof. 3. Should horses wear boots on all four hooves? Most riders just use hoof boots on the front hooves. Some use them only on the rear hooves. In some situations, you might decide to put boots on all four hooves. 4. How can you tell if your horse needs boots on the hind hooves? 5. Why is it best to have boots on the front hooves? …occur mostly on the front hooves. That’s why it’s usually a good idea to start out with front hoof boots and see how it goes. If you decide your horse needs boots on the rear hooves as well, you can always add them. 6. How long does it take to break in hoof boots? The break-in process for new hoof boots is very similar to the break-in process for new shoes. Allow your horse to wear the boots for fifteen or twenty minutes at a time until he is completely comfortable wearing them. Riding through water can speed up the break in process. If the boots you choose have leather components, softening those with a good leather conditioner will help reduce stiffness. 7. Can hoof boots be worn for extended periods of time? Once your horse is used to them, he can certainly wear them for long rides. Be sure to take them off at break time during trail rides to check for stones and simply give your horse a rest/change. If your horse is wearing boots because of a hoof condition or injury, naturally you can leave them on most of the time. Take them off for a while every day to allow your horse’s hooves to “breathe” and let the boots air out. Check for chafing and any other problems during this break time. You may wish to have two sets of boots and switch them out daily. 8. Is it safe to leave a horse in hoof boots for an extended period of time? Properly fitted hoof boots should be safe for your horse to wear most of the time. You may wish to use duct tape to secure straps and prevent them from flapping and possibly getting caught or damaged. 9. How can you prevent dirt and bacteria buildup in hoof boots? When you allow your horse’s hoof boots to air, first wipe them out with a damp cloth to remove excess dirt. Spray the insides of the boots with a 50/50 mix of water and apple cider vinegar. Place the boots in an area with good air circulation to dry. 10. Can hoof boots be worn over traditional metal horseshoes? Using hoof boots over horseshoes is a good way to provide extra shock absorption on pavement. Many riders use both hoof boots and metal horseshoes for riding in parades and similar activities. This combination is also helpful when transporting horses. It protects against slipping and possible injury while trailering. 11. How can you protect the insides of hoof boots from excessive wear? The insides of hoof boots take a beating, especially when used in conjunction with metal shoes. You can help protect the interior of hoof boots by purchasing pre-made hoof support pads, or you can make your own using foam padding or thick leather. Use of insoles protects the boot sole from wear. You can just change out the insoles when they begin to show signs of wear. 12. How do you clean hoof boots? Scrape the soles and outsides with a hoof pick or dull bladed knife if they get muddy. Remove any insoles and wash the boots inside and out with a strong spray from the hose. Set them in a warm, airy place to dry thoroughly before the next use. 13. Are hoof boots good for endurance riding? Many serious endurance riders prefer hoof boots to traditional horseshoes. Hoof boots protect the whole hoof against injury and wear. They also provide better traction than metal shoes. 14. Can you use traction studs with hoof boots? Yes, many riders use traction studs or screws to add more traction to the soles of hoof boots. This helps make riding on wet grass, ice or snow a little bit safer. Just take care that the sole of your horse’s hoof is well protected from contact with these additions. Insoles (as described above) can help with this. Whether you’re looking to go barefoot because you think your horse should be as natural as can be, or if you are looking into what are the best hoof boots for horses because of a medical issue, hoof boots can be a real saviour. If you’re looking for a hard wearing all round great hoof boot then go for the Cavello Trek Slim Sole Hoof Boot. 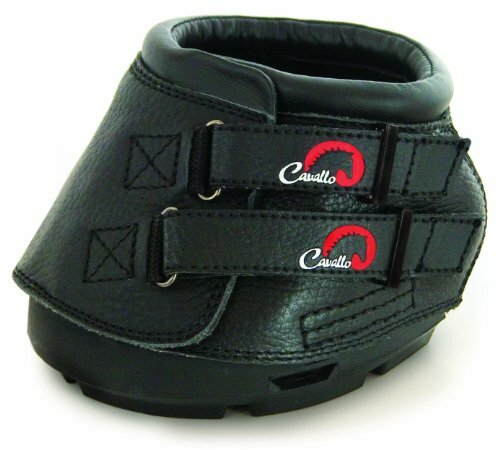 If you need high quality leather pairs of boots, then opt for Cavello Simple Hoof Boot For Horses. If your best friend has a hoof issue and is in need of something to keep his feet safe, clean and comfortable, then try the EasyCare Easyboot Cloud Hoof Boot.